It’s light, fluffy, tender, and sweet. It’s bursting with lemon flavor and spiced with a little ginger. 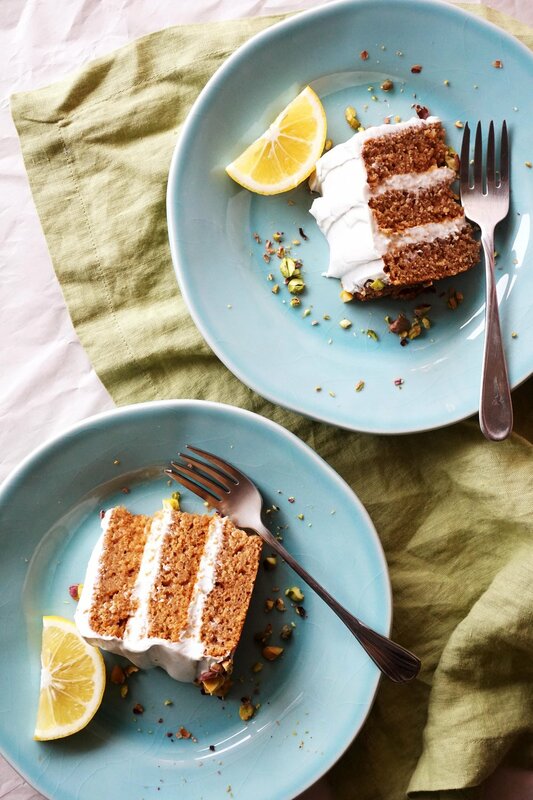 It’s a Lemon Ginger Pistachio Cake you will - I promise - absolutely love! I realize that the New Year’s trend of reflecting on the previous has passed, given that it’s been two weeks since the New Year arrived. And I also acknowledge that when I finally did reflect, I did so with a weird hesitation, not sure if I actually wanted to do it or not. Annnnnd, that being said, I did more reflecting today. Never did I ever imagine myself, after having created this blog (which is a whole other story), standing in my kitchen on a rainy day off from school and work, feeling the excitement about a making an entire cake from scratch for no other reason but to share the recipe on the blog (and, of course, enjoy every minute of doing so) run through my veins . Five years ago, all I wanted to do with food was make sure it fit into the nutrient distribution I had so meticulously laid out day by day. To bake was to exercise restriction, discipline, to see a temptation in some food I deemed unhealthy and to strengthen my restriction muscle by making up an excuse for why not to eat it. Never did I ever think I would attend Cal Poly San Luis Obispo and fall in love with everything about this place. Never did I ever think, after a two years of following a vegan diet, that I would give it up. Never did I ever think recovery from an eating disorder would be so. dang. challenging. Never did I ever think I would change career paths twice in college, once from a journalism major to a nutrition major, and once from a Registered-Dietitian-to-be to a food-blogging, cookbook-writing, future-café-owner. Never did I ever imagine heartbreak would hit me with such pain like it did this year, or that I would be able to fall in love again. Never did I ever picture myself moving back to Minnesota after college. So many surprises, unexpected twists and turns and unravellings and wrapping-up’s that I just didn’t see coming until they came. “Never say never” - it’s just the right cliché phrase here, huh? Every so often, I still catch myself letting a “never” statement slip out of mouth, and just before I can finish, I’m reminded that I am clearly not the one who should be in charge of major decision-making, even in my own life. So, I’ll take the word “never” out of my everyday vocabulary and let myself feel excitement in things unknown and unpredictable. After all, even though those sometimes scary unknown and unpredictable moments, I am carried to a point of safety where I can look around, look back, and feel so grateful for what is and for what was. Anywho, CAKE. I absolutely fell in love while making this and admiring its beauty after it was all put together and done up. Something about the colors, the layers, the swooshes of frosting blanketed over a sweet, tender, layered lemon cake just… ugh, it all just got to me. I hope it all gets to you in that way, too, and I hope you love it like I do! Preheat the oven to 350F and lightly grease 3 6”-diameter cake pans with coconut oil. Set aside. In a small bowl, whisk together the flour, baking powder, ginger, and sea salt. Set aside while you prepare the wet ingredients. Make the cake. Begin by creaming together the coconut sugar, coconut oil, and agave nectar until smooth using a stand-mixer or hand-mixer. You’ll know the mixture is creamed and ready when it turns from a golden brown to a light brown and only a few specks of coconut sugar remain. To the creamed sugar + coconut oil, add the 2 eggs, vanilla extract, and lemon zest and beat again until smooth. Pour in half of the kefir and lemon juice, followed by 1/2 of the combined dry ingredients. Mix, repeat the process, and mix again just until the batter is smooth. Don’t over-mix! Divide the batter evenly amongst the three small cake pans - each one should be about 3/4-full. Bake for 22 minutes, or until firm in the center and golden around the edges. The batter itself is already a light golden color, but when it’s baked through, the edges will be slightly darker. You should also test by poking a toothpick through the center of each layer - it should come out mostly clean. Let the cakes cool completely before you frost them. While the cakes cool, prepare the frosting. Cream together the cream cheese, Greek yogurt, and agave nectar using a stand-mixer or hand-mixer until smooth. Add the ground ginger and whip on high until light and fluffy, about 5-6 minutes. Assemble the cake. Place one layer down on a cake stand or plate, then smooth a layer of frosting. You should use about 1/4 cup of frosting on each layer, making sure to save enough to frost the entire cake once all the layers are stacked. 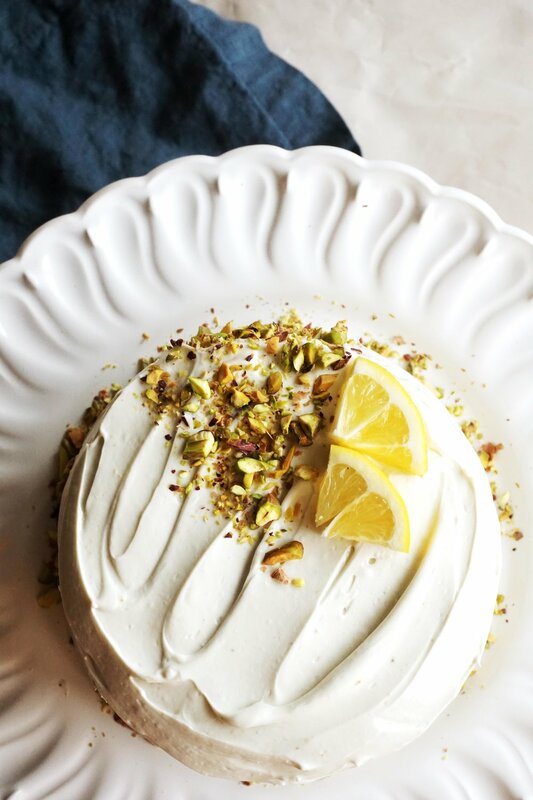 Garnish with chopped pistachios and sliced lemon, if desired. Slice and serve. Store leftovers in an airtight container for up to one week. The frosting may change color slightly, but that is just the result of the Greek yogurt and cream cheese coming in contact with oxygen. The cake will also toughen up in the fridge, so keep that in mind. This post is sponsored by Lifeway Kefir - all opinions and statements are my own. Thanks for supporting my blog and helping me create delicious recipes like this one!